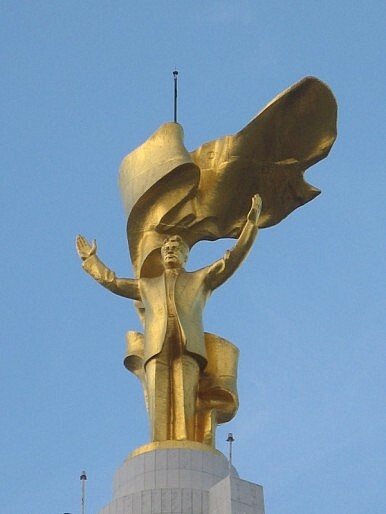 The statue of Saparmurat Niyazov, Turkmenistan's first president, rotates to face the sun. The glittering gold statue of Gurbanguly Berdimuhamedov in Ashgabat got headlines, but it’s a distraction. Downtown Ashgabat has a new monument: a bronze statue, covered in 24-carat gold leaf, of President Gurbanguly Berdimuhamedov riding a horse atop a massive marble pedestal. Berdimuhamedov has a dove in his hand and the entire monument is 69 feet tall. Unveiled Monday in Turkmenistan’s capital, the statue can be seen as a testament to Berdimuhamedov’s growing cult of personality. Turkmenistan is repeatedly listed as among the worst in the world in terms of human rights, from press freedom to freedom of movement, religious expression to political dissent. But little information gets out of the country, and that which does is tinted by the state. Essentially, we see what Ashgabat wants us to: smiling people and glittering statues. The government went on a crusade against satellite dishes in April — what Human Rights Watch called a “war on satellite dishes” designed to shut people off from outside broadcasts — and Ashgabat tightly controls what information comes in, and gets out of, the country. What’s come out of late has focused almost entirely on energy — the prospects opened up by the potential for a deal between the West and Iran at the end of June and the option to pipe gas under the Caspian Sea and into Europe, avoiding dealing with Russia for Central Asian gas. The country’s extensive gas reserves have given it one of the world’s fastest growing economies. It is a familiar ploy by leaders the world over, taken to extremes by autocrats: highlighting specific, regime-friendly stories, while censoring all other news. Another trope on display here is that of the benevolent ruler responding to the demands of the people. Berdimuhamedov stands out among the strongmen of Central Asia — Uzbekistan’s Islam Karimov, Kazakhstan’s Nursultan Nazarbayev, and Tajikistan Emomali Rahmon — for being his country’s second autocrat since independence. Berdimuhamedov, who is also called “Arkadag” (meaning protector), took power in 2006, after his predecessor, Saparmurat Niyazov, died. Niyazov ensured that gas-rich Turkmenistan remained one of the most isolated countries in the world, ensuring no free media, allowing little foreign travel and enacting a series of decrees that renamed the days of the week and months of the year after himself and members of his family. Hospitals outside the capital were closed, opera and the circus were both banned, and all schools and universities had mandatory classes for studying the Ruhnama, Niyazov’s book. His ministers were forced to perform a grueling annual “walk of health” through the capital. Niyazov traveled by helicopter and met them at the finishing line. When he took office, many hoped that Berdimuhamedov would reform the country. But his tentative steps in peeling back the country’s isolation were cosmetic, targeting his predecessor’s cult of personality and substituting his own. He reverted the names of the days of the week and opened internet cafes — but the internet came with heavy censorship, huge fees, and soldiers at the cafe doors, despite lofty promises to the contrary. Berdimuhamedov’s statute may not rotate to face the sun — as his predecessor’s does — but it follows the same trend: nothing more than a glittering distraction.